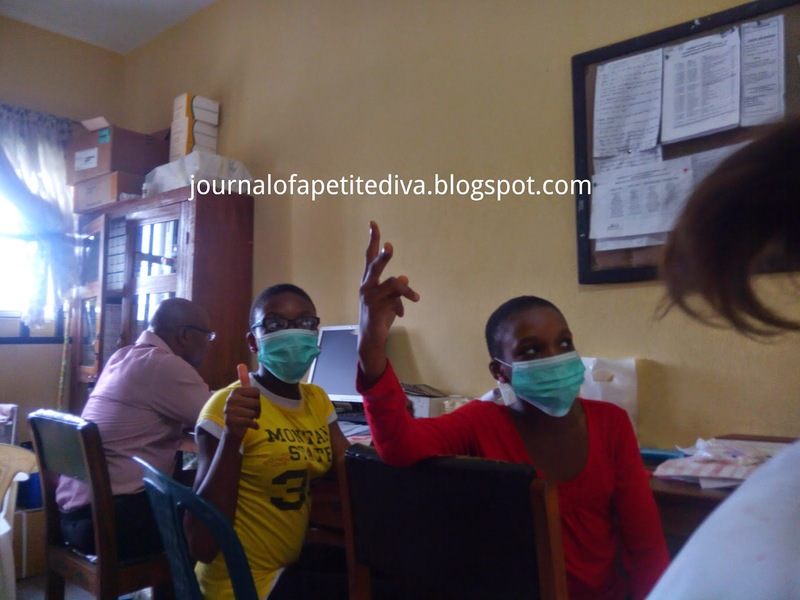 Journal Of A Petite Diva: HELP! I AM NOW A GROWN UP!! Hey guys, how are you doing? How was the weekend? I should have put up this post yesterday but the useless network I use went off yesterday. Like completely! How I survived, I don't know. They had better give me 1gb of data as an apology for the nonsense they did yesterday. Anyway back to today's topic but first let me cry....I am now a grown up *wailing* *rollingonthefloor*. Nobody should abuse me o, let me cry well (it is only for today). What made me realise this? After fighting to go to church (it rained like crazy yesterday and refused to stop for hours), I finally got to church and a consultant paediatrician who works at the same hospital I do greeted me and gave me a letter (above pic). Said he personally kept it for me after it was written since we are in the same paediatric department. At first I was like hmmm, what is it o? Some days before he had asked for my full name (he used to call me Diva...how he knew I have no idea) and I knew something was up. So the letter was not a shock. However the contents was the shocker. CO WHAT?! CO HARVESTER!! WHO? ME?! This small me? How? I am just a Pharm 1. I am not up to 10 years in the pharmacy profession. After thinking about it, I realised I am now a big girl. Growing up all the harvesters and co harvesters and launchers and co launchers that were called in church were big people (adults) so I guess I am now adult....lol. I knew I was an adult since I am just kidding. Let me explain the whole co harvest thing to you guys. 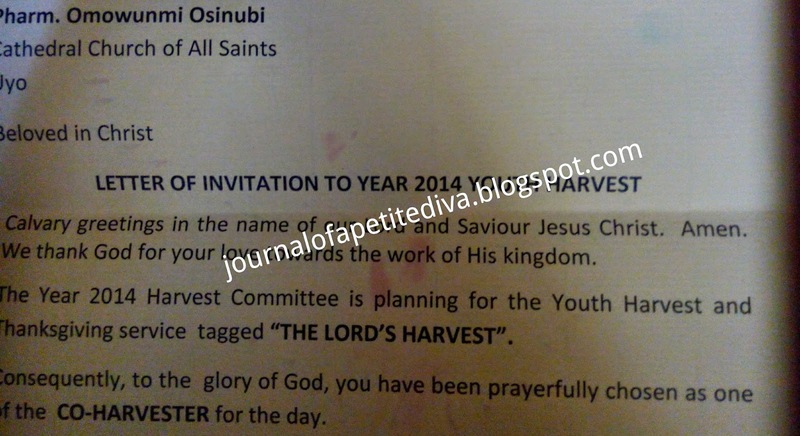 In my church (Church of Nigeria, Anglican Communion) we usually have difderent harvests once a year...youth/young people harvest, adult harvest, professional harvest and so on. During that time if there is any major need of the church it is told to the congregation and people are expected to donate. However more pressure is on the chief harvester and the co harvester. Now the issue is with what amount would do the co harvesting? I have three options: run away from church this Sunday (the youth harvest is this Sunday...you are all invited by the way. You would all be the co co harvester...*grinning*), give what I have (and when I have more give more) or pledge a sizeable amount then give it later when i have the money. So what do you think I should do guys? My mum laughed when I told and suggested an amount. I am sure when she told my grandmother, she would roll of the bed. Me, a co harvester? Okay o, maybe it means bigger things are coming my way. It is all good though. It is for the work of God and that is major important. While I was still wrapping my head around the co harvesting thing, at the end of church service a lady comes to me and says 'you are a pharmacist, right?' And I go, what again o? She now tells me that a group of female medical professionals where going to give a career talk and they had been looking for a female pharmacist. I was like 'you want me to give a talk? Like speak in public without more than 2 months' notice to psych myself up'. I tried to give some excuses to avoid it but she said even if I cannot come I could help get another female pharmacist that could come. However as I was coming back home and was thought about it, I realised that talking to kids was one of the things I wanted to do. And here I was given an opportunity to practise and I was letting my fear of public speaking prevent me from achieving my goals. Like God literally dropped the opportunity, I didn't have to ask for it I was invited and fear wanted me to run away from it. I decided that I needed yo conquer my fears. Therefore I have decided that I would call her up and take up the offer but I need moral support aka photographer. I am trying to get one of my friends to follow me and help me out when I begin to stumble. Oh God! What am I going to say? I don't want to scare them from studying pharmacy. What of if I am boring? I think I would just try to imagine that they are the nieces of my friend who spent some time with me at work or my baby cousins who are all bigger than me in size. Oh well, wish me luck guys. I am now a grown up! By the way I water marked these pictures with Fotor app on my Phone....Yay!! Anyway moving on to other news, I washed my braids yesterday. I love the easiness of this braids, I just hope my hair would be intact when I loosen it. I loosen it in less than 10 days. I am keeping my fingers crossed. I can't afford another set back. Hey, have you guys heard? 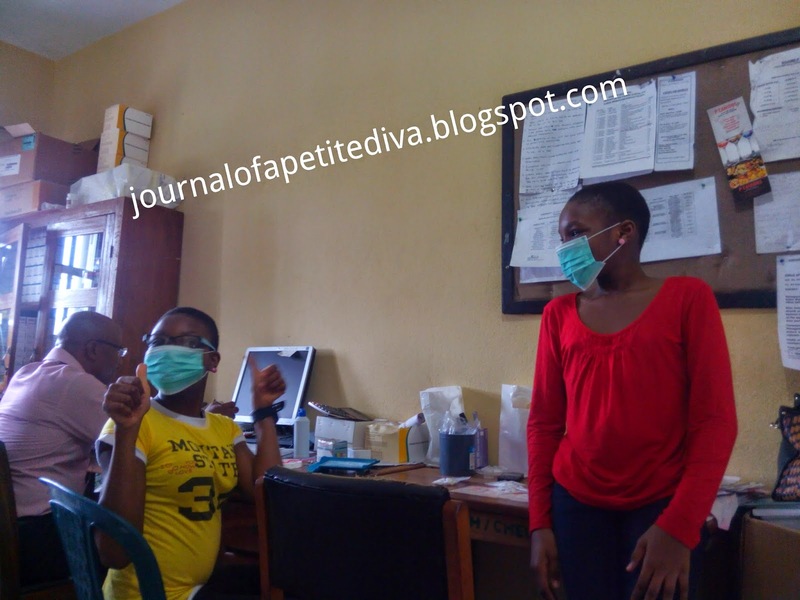 WHO has declared Nigeria Ebola Free.....Yay!!!! *Dancingsekem* (I have no clue how to dance it) Take that! America Ebola!! Don't come back again and leave the world alone. To find out more on our Ebola free declaration, check here. Thanks to all the bloggers that left their comments on the blog spotlight post, you guys are awesome. I would publish a post listing all the address and create links to them. You guys are amazing. You need to check the post to understand what I mean. I have to run now. I just got a call from the organiser of the career talk and I need to prepare my notes and practise. I don't want to disgrace myself o. 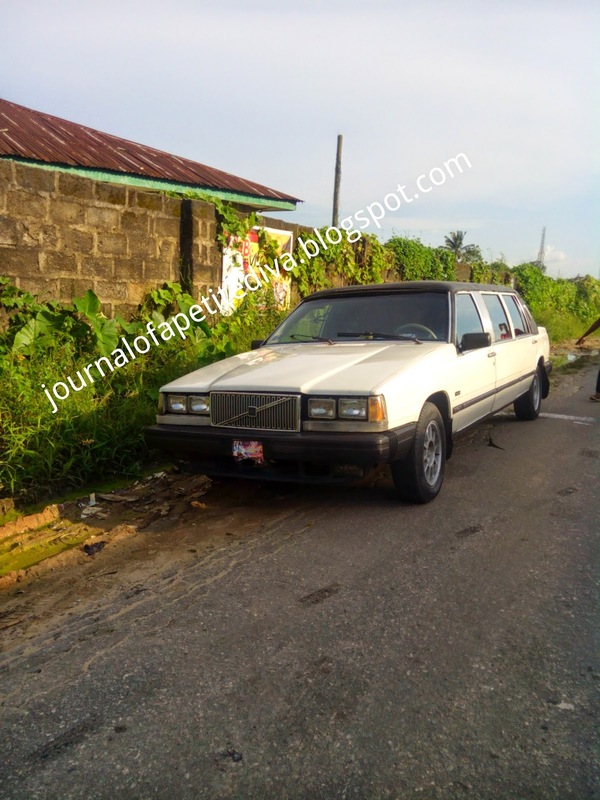 Before I leave I saw this Volvo limo packed on the street and thought I should share. Is limo still the dope car for prom pick up (for those that did prom)? During my time there was nothing like prom in Nigeria. Nowadays I hear it is different, like I said I am now a grown up....hahaha. I enjoyed reading your post and learning more about your church customs-- I was quite confused when I first read "harvester" but quickly understood in relation to a church. That's such an important role for you to carry out, congratulations on being a full grown up who is carrying on Christ's work. I must admit that I should give more of my earnings to my church, I usually give whatever I have but I know it's not nearly enough. I also do things like teach Sunday School (I usually love teaching little kids about God and sharing my own experiences). It's so cool that you've been asked to talk to kids-- they will learn so much from you and be so inspired! You will do an amazing job and they will remember what a cool lady you are, as well as want to be like you when they grow up haha. 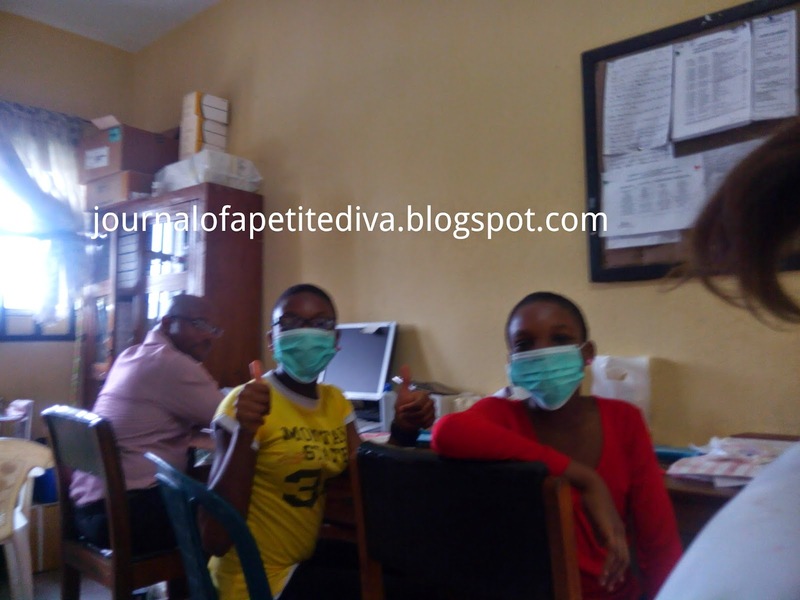 Congrats on Nigeria becoming Ebola-free, that is fantastic news! Just this morning my friend and I were sad over how a young nurse in the USA contracted the virus and now she is obviously devastated... The hospital there didn't know how to deal with ebola either... It is sad sad news. Thanks dear. It is a great thing what you are doing with the kids. I wish i had that confidence. I do hope the nurses infected recover, this disease is getting out of hand. I pray that there would be no other infected person again. Big things are coming your way mami. .. I hope you are ready to receive it... just do whatever you can and leave the rest to God. About the talk, hmnnn I wish I can just follow you to give you real morale support. Not photography support o cos I am a terrible photographer. I know you'll be fine. Just come back with plenty gist for us o and make us proud. Amen oooo, i have my containers ready to receive it and keep it safe. Thanks for the advice, i would do just that. Don't wish joor, you should have been there. The gist is already up so hurry and read it while it is still hot. 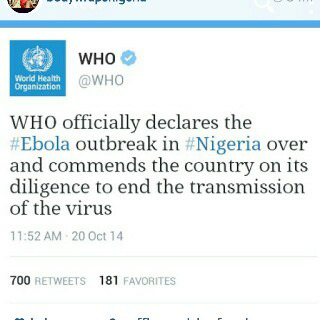 I am happy for my dear country and I wish other countries Ebola free ijn. I am sure you will do well in public speaking, my teacher use to say look at the end of the hall or someone that appears friendly and you won't have to be shy. Thank God for his mercies o, i wish them the same too o. Ebola has stayed for too long. Thanks for your public speaking tips, i think it worked. Congrats on your new "appointment", I'm an Anglican so I know what it involves! God is your muscle jare. Thank you...Afi appointment lol. Thanks for the encouragement. Nice to see another Anglican here. LOL @ you're now an adult. As for the Ebola ish, the americans should make good use of their serum (which i don't think is useful to them) or with all humility ask us for advice on how we dealt wiith the virus. They have sent people already. CDC guys came to find out how we did it. I hope they get it under control soon.